It is a group that has formed within the Austrian Alpine Association (Österreichischer Alpenverein or OeAV) with English as the main language. Do you know of someone who would like to be involved in the Alpine Club (OeAV), who speaks English? Please let them know that they -and you too- are welcome in our group! What is the OeAV and do I need to be a member? The OeAV is the main Alpine Association in Austria ("Alpenverein" in German). To join in our activities you need to be a member of the Alpenverein. A membership has many advantages, see here. Because we enjoy hiking in the mountains. Maybe our proficiency in German is not where we would like it to be. We support the Alpine Association. Do I really have to speak English? Mostly, yes. We have members from many countries all over the world so the common language is English. But of course it is not forbidden to speak any other language. Do you only offer hikes? We do mountain hikes, climbing, snowshoe hikes, ski touring, simpler hikes and occasionally simpler bike tours (on or off road). We also run mountain related courses in the english language, for example avalanche courses, first aid, high alpine mountaineering ("Rock and Ice") and climbing courses. As these courses are run by qualified mountain guides, there is a fee for participation in the courses. What are the hikes or other activities like? Events are categorized into levels of difficulty and duration so you can choose something that fits your abilities. If you are unsure, feel free to contact the trip organiser. Generally there is no fee to take part in any individual event (apart from the courses). Organisers may not demand a fee for the organisation. The only costs are the annual Alpenverein membership, and any general costs related to the event (e.g. transport, accommodation, food & drink, equipment hire etc). Note that as an Alpenverein member, you receive a 50% discount on the price of sleeping in the Alpenverein huts (also outside of Austria), and discounts in huts run by other mountain organisations (Naturfreunde, ÖTK). Our members are generally between 25 and 60, but we do have older and younger members too. So pretty sure you'll find somebody of your age. But anyone from the age of 18 upwards is welcome - and where suitable children under 18 are welcome to join when accompanied by a parent. Not sure what to bring? Check out a sample Gear List. What to take and what not to take is always a problem. Use this not as a rule but a guide. Just remember that others do not bring extra rain gear nor a spare walking stick. What do the "Technical" and "Physical" Requirements in the trip descriptions mean? We use the same ratings as the Alpenverein. Here is an english translation of the legend. I am only coming to Vienna for one semester. Can I get membership for just half a year? Unfortunately not. The Alpenverein only offers membership for a whole calendar year. Students under 27 however do get a reduced membership rate. Please see our membership page for details. If you are only joining for 1 year, please remember to give notice of your intention to leave the Alpenverein in good time (before the end of September), otherwise your membership will be automatically extended. How do you organize transport for the events? It depends on the events. Some events can be reached with public transport. For other events we car-share, sharing the cost of the fuel. Sometimes it may be necessary for somebody to hire a car, as most of our members do not own a car. In this case the costs of the hire car are shared by all participants who are not travelling in their own cars. We appreciate it if people would indicate in the registration if they are able to organize and drive a hire car. Transport details for individual events will be communicated by the trip organizer to the partipants. Can you organise a private hike for our group? No, unfortunately not. The events we organise are intended for our members. As most of us are not certified hike leaders or mountain guides, we would not be entitled to lead groups of paying guests. Can you help me organise my trip to Austria? Probably not. If you want some hiking ideas, mainly around the Vienna area, take a look at our archive. Otherwise, you would be better of contacting the regional tourist information offices. What data do you have about me, and what do you do with it? The Alpine Club Vienna maintains a mailing list of its members. Until May 2018, members on this list signed up personally at one of our meetings or online. The data provided during sign-up includes Name, Email address, Telephone Numbers, Postcode and Nationality. This data is only used for internal purposes (newsletter, organisation of our events and statistics), and with the exception of our newsletter service provider, currently Mailchimp, it is never passed on to anyone else. I want to be added to the mailing list. What should I do? Please click the link "Get our new events in your mailbox, subscribe to our newsletter" here, or in the footer of our website. Are you the VIC hiking club? No. 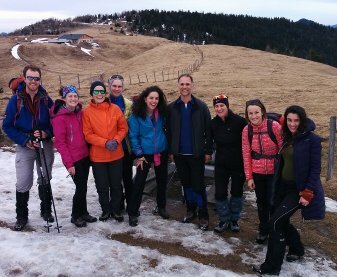 The VIC hiking club is the hiking club of the United Nations in Vienna and you need to be an employee of an international organisation to participate in their events. We, the Alpine Club Vienna, are a part of the Alpenverein in Austria and anyone who is a member can participate in our events (subject to suitability) - and anyone can become a member! I sent you a mail, but didn't get a reply. Why not? There may be many reasons. First of all, this is a group run by private persons, in their free time. Sometimes it takes a bit longer to respond to your mail, but I always try to answer genuine enquiries. It is also possible I overlooked certain mails - if so, I apologize - please write again if you don't hear back within a few days. However, we don't respond in principle to commercial or spam mails - e.g. offers of partnerships with travel agents, offers to revamp our website (we actually quite like it the way it is! ), requests to provide resting places in our bank account for the estates of recently deceased rich relatives etc etc.